In a year with a spate of lift breakdowns, all 16 town councils received top marks for lift performance in an official report card for town councils. 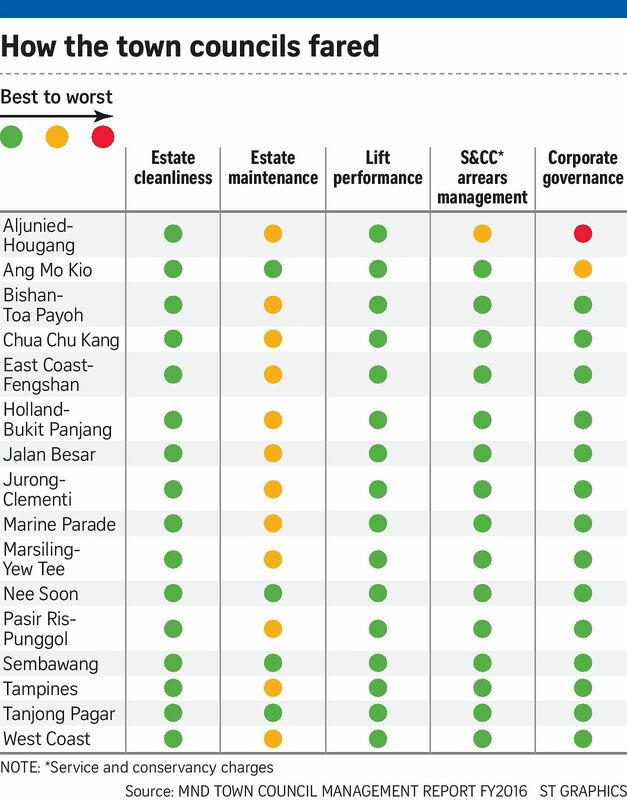 Less stellar results were recorded for corporate governance, in which two town councils - Aljunied-Hougang Town Council (AHTC) and Ang Mo Kio Town Council (AMKTC) - did not do as well. Estate maintenance - a perennial problem - also remains an issue, with 12 out of 16 town councils getting an amber rating for breaches, like obstruction of common areas. These results were in the Town Council Management Report for financial year 2016, which ended on March 31 this year. The report was released by the Ministry of National Development (MND). The annual report assesses town councils in five areas: estate cleanliness, estate maintenance, lift performance, management of arrears in service and conservancy charges, and corporate governance. They receive green, amber or red scores, based on measurable objective criteria submitted by town councils and their auditors. The all-green rating for lift performance comes in a year that saw a multitude of lifts malfunctioning in ageing and new Build-To-Order (BTO) housing estates alike. Last year, the Housing Board noticed that lifts installed by Sigma Elevator in their first year of operation were breaking down at a higher-than-usual rate. The problems with Sigma lifts persist. To get a green rating, each estate must have fewer than two breakdowns per month for every 10 lifts. It must also have fewer than two in 100 lifts with a faulty automatic rescue device, which will bring a lift to the nearest landing and open the doors if there is a power failure. MND said these criteria were fulfilled, and the automatic rescue device failure rates were zero for all lifts managed by the town councils. Pasir Ris-Punggol Town Council chairman Zainal Sapari said: "Despite the reports of lift issues in some of the new BTO flats in Punggol and older lifts in Pasir Ris, the total number of such cases is still very small relative to the total number of lifts we are managing." Still, every lift breakdown is taken seriously, and the town council will work with the lift company to resolve the cases, he added. For corporate governance, AHTC received a "red" banding. The reason is its late quarterly transfer to the sinking fund, a waiver of quotation not in accordance with the Town Council Financial Rules, and a report on the count of its fixed assets that was not certified in the correct manner, said MND. Despite the reports of lift issues in some of the new BTO flats in Punggol and older lifts in Pasir Ris, the total number of such cases is still very small relative to the total number of lifts we are managing. AHTC chairman Pritam Singh of the Workers' Party said remedial actions have been taken. For instance, AHTC has improved its internal procedures to monitor key deadlines, after a quarterly transfer to the sinking fund was three days late owing to staff oversight in signing the bank instructions. On the waiver, he said AHTC had assessed it was more viable for its existing service provider to continue doing payroll processing and attendance, and e-leave tracking. The Ang Mo Kio Town Council was given an "amber" banding as it did not seek approval from the correct authority to waive quotations. AMKTC chairman Ang Hin Kee told The Straits Times the town council's general manager had approved waivers for four projects, each valued at $3,000 and more. Two projects had to do with noise and insulation problems with air-conditioners, and two were for the replacement of pump room parts. Under MND rules, only the town council's chairman can waive quotations for projects of such amounts. Mr Ang said AMKTC did not suffer any financial loss as a result. The general manager was asked to go last year and is being investigated for alleged corruption. Though he had signed the four waivers, the cases are not related to his removal or the investigation, Mr Ang added.